Gnomon Live 2017 in Melbourne and Sydney were standout events for the digital art community. Following the success of the first Gnomon Live event presented in Melbourne in March 2016, the 2017 program extended across two weekends in Melbourne and Sydney. Responding to feedback from 2016 a carefully crafted master class program provided top level knowledge sharing, networking opportunities for recruitment outcomes and advise and support on broader work place issues. The opportunity to work with Gnomon founder Alex Alvarez to curate a speaker line up and craft a program for the Oceania Region has resulted in a resource that supports both studio needs, the needs of education institutions and those of individual artists. In designing a live event we acknowledged that a creative career is one of hard work, passion and commitment. Whilst story telling on screen can take huge teams, ultimately an artist’s contribution requires a degree of solo effort. No one can push the stylus for you, your inner values drive your decision making, exposed in order to actualise characters and scenes. We believe mentorship and community offer a powerful poultice to soothe a path that is bound to throw up obstacles and helps artists to not only survive but thrive in a challenging career choice. One that is marked by a pursuit of triumph and mastery in artistic endeavour, amidst the need to master complex and advanced technology and adapt to rapidly expanding applications for computer graphics. By design and evolution Gnomon has evolved as a mentor model of education. Alex Alvarez has been dogged in his commitment to building a model that is true to his vision that launched a training facility he wanted to learn from. From its inception as a continuing education centre to its now fully fledged status offering a Bachelor of Fine Art, to online tutorials and regular community events and now Gnomon Live Australia he has maintained his emphasis on providing mentors from industry. Based in Hollywood they have had the advantage of developing a training centre and community development program that can draw on hundreds of studios, artists, technological expertise and major entertainment projects. As such the mentor model of education that Gnomon has created over 2 decades is deeply embedded in the community it ultimately serves and has resulted in a 96% placement rate for Gnomon School graduates and significant global recognition and respect. The Gnomon Workshop, an online tutorial resource, has been the basis for many Australian artist’s ongoing education and a library resource for most of our local colleges. The mentor is an experienced and trusted guide, a teacher, who leads by example and helps people discover their unconscious competencies. Good mentors are committed to the reciprocal benefits that come from collaborative learning. The feedback speaks for itself. The 2017 Gnomon Live line-up offered exceptional mentors. We are grateful to Alex Nice, Neville Page, Alex Alvarez, Josh Herman, Tran Ma, Nicole Hendrix, Miguel Ortega, and Brian Recktenwald for their generous and detailed sharing of their knowledge and experience. They not only provided top level tips and techniques to improve quality and efficiency of work and insight into career pathways and cross sector application of skills, but also inspired us to achieve our own standards of excellence and motivated us to pursue personal triumph and mastery. The opening night saw the first ever screening of The Ningyo in Australia. Thank you to Ian Failes for guiding us inside the making of this masterful creation with a behind the scenes exploration with Tran Ma and Miguel Ortega. Our local industry leaders with the support of Alwyn Hunt from the Rookies took us inside some of the challenges and opportunities facing Australian screen artists. Thank you to James De Colling of Zero Latency, Adam Bax of Playside Studios, Raphael Pimental of Luma Pictures, Simon Bronson of Method Studios, Aaron Hoffman of EA Firemonkeys, Matt Estela and Alex Fry of Animal Logic, Morten Rowley of Supervixen, Michael Tomkins of Buy Somewhere, Greg O’Connor of Iloura, and Mick Hammel of Plastic Wax. The networking elements of the event with both international experts and local industry leaders was an important element in building a community event that provided optimum conditions for ongoing and meaningful connection, with like-minded peers, in ways that can expand personal capacities and assist in conceptualising new possibilities. It’s a privilege and opportunity for Australia and Gnomon to continue to develop and evolve this program in collaboration with the local computer graphics industry. We are very grateful to our partners for helping make the event possible. Ideas on Design as presenting partner have for more than a quarter of a century developed events and resources that connect industry leaders with those seeking advancement. To the Collie Print Trust, Chaos Group, Screen NSW, Film Victoria and Wacom for making the program accessible to all sectors of our digital art community. To our local colleges for their spirit of collaboration and openly backing Gnomon Live to kindle connections across the Pacific. To our media partners for sharing information: CG Channel, CG Meetup and Artstation. 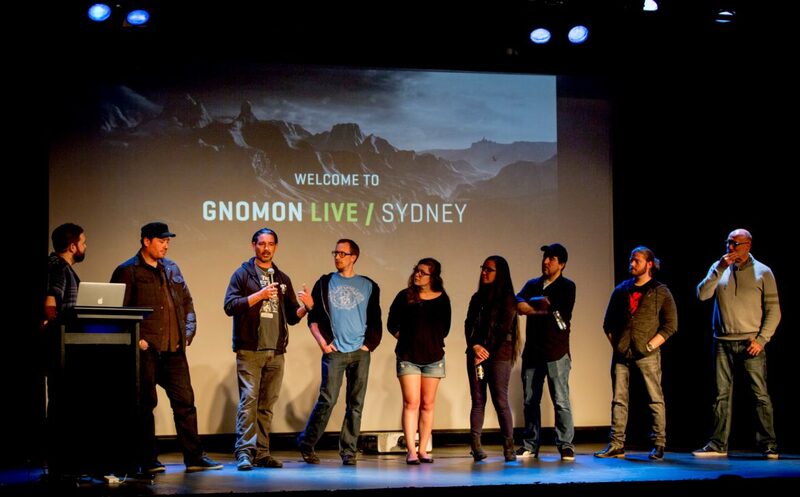 A special thank you to all the volunteers who help bring Gnomon Live to their peers. Olivia Haines, Mo Chamas, Finlay Mauchline, Christiaan Gerritsen, Ester Moncrieff, Lylah D’Souza, Damien Rogers, Agudo Garamia, Nathan Drew, Jacob Duncan, Nickola Orr, Rebecca Louise, Beck Selmes, Angela Sae-lam, Stefan Gize, Sebastian Danta, Matthew Voysey, Carly Cheung ,Diana Ayoub, Martin Evans. To Cassandra Downs and Corin Sadlier thank you for photographing the event in Melbourne & Sydney respectively. Thanks to the Gnomon crew in LA who have had to get their head around working with those who live in their future … time differences and cultural differences create new challenges and opportunities. We are grateful that you have embraced the extension of your programs outside of LA. To the Ideas on Design team Aaron Down, Chloe Lucchesi, Monika Batchelor, Elise Bufton. We are a small team who work hard to craft events we believe will have meaningful and lasting impact on our creative community. And of course to all of those who attended, thank you for choosing Gnomon Live for your ongoing learning and to build a community event for artists in the region. They were two exceptional weekends and we look forward to what future Gnomon Live events will bring!